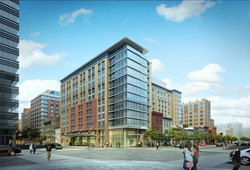 WASHINGTON—EB5 Capital has provided $40.5 million in preferred equity financing for Columbia Place, a dual-branded Marriott hotel project being developed here by Quadrangle Development Corp. and Capstone Development. Columbia Place is composed of two new Marriott hotels—a 357-room Courtyard and a 147-room Residence Inn—within one building. The two hotels will be built across from both the existing Marriott Marquis and the Walter E. Washington Convention Center. The three hotels will include more than 1,600 rooms. EB5 Capital raised the funds from 81 foreign investors through the EB-5 Immigrant Investor Program. Brian Ostar, director of global operations, led the EB-5 fundraising effort for this project. Patrick Rainey, associate director of investments, structured the EB-5 investment. The Marriott Marquis, the first phase of the three-hotel Marriott development, opened on May 1, 2014. The hotel is connected to the Convention Center via an underground tunnel. EB5 Capital provided $5 million in equity financing for the Marquis.